It’s Friday afternoon, and the mad dash down the M7 onto the M5 is reduced to a crawling pace while the pulse of brake lights strobe for kilometres ahead. She’s chokas. The gateway from our city circles of both Sydney and Melbourne aren’t a pretty sight come Friday night, and having to sift through gridlock traffic isn’t just a rite of passage for snow-goers, but a real test of our commitment. As we breach the city limits, traffic begins to breathe, ebb and flow … so we compensate for lost time by guzzling instant coffee at Pheasants Nest, chowing down drive thru at Sutton Forest and fast forwarding, what’s essentially one-third of any good jaunt – the journey. Most of us are guilty when it comes to being fuelled by the thought of being first at the ticket turnstiles come morning. This unhealthy habit perpetuates the notion, and the numbers which consolidate these roads as some of the most dangerous in the country. Meanwhile we’re simultaneously depriving ourselves of the full experience – revelling in the natural wonders of the Australian High Country. Prior to our departure, from Jindabyne to Mt Buller one morning – The Range has been gifted with a series of small snow falls, totalling the 15cm mark. As the two of us saddled up our Volkswagen Amarok (Nice car by the way) , we’d be soon making our way up to Thredbo for a quick morning rip. 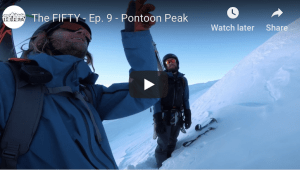 One of our biggest short falls as skiers and snowboarders is that we’ll do a full day’s riding then undertake a lengthy drive later that night through a region loaded with booby traps. Those being icy roads, wild life and other drivers doing the same thing as you are. No wonder one of Australia’s biggest automotive wreckers is located at Cooma, just 60 minutes from the Alpine Way. Fatigue plus wild life, that’s all too eager to jump into your grill isn’t a great combo. Rather than doing the full-day stint, we’d perform an intensive attack from first lifts ’till 11 am. Getting our fix, then doing the dash across and into Khancoban we’re we’d sub out floppy big macs for crusty buns and a relish made from a recipe which goes back generations – another tick in the road trip box. Local cuisine . As we left Thredbo and approached Dead Horse Gap, it would be clear that’d we’d be traveling over a snow-coated road surface for a few km’s. Although we’d be chartering this in our 4WD Amarok , there’s still that unnerving sensation of driving on a marble surface that should always have you driving on high alert. The key here is to avoid locking up, here are some great tips. In regions, prone to being socked in by winter even the most ‘domestic’ vehicle will be equipped with snow tyres, and in most cases here – people will own a AWD at the very least. Chains can be the crux of any pow day and trying to fit a cheap set, roadside is a great short cut to unhappiness. Spend the money on chains, get a reputable brand and learn to fit ‘em . In NSW, Police will often run checks in the chain-bays up to Perisher and Thredbo , while in VIC it is mandatory for all Vehicles to carry chains, not just 2wd’s. There are fines for not complying, like copping 50 lashes with the powder belt. 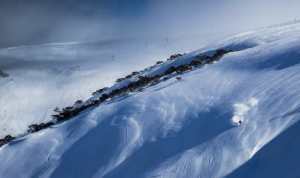 When resort hopping, no places are further apart than Thredbo and Mt Buller , with the exception of Mt Baw Baw . With a good 7 hours separating the two, it would be all too easy to slip into our former habit of lead footing it down the highway. Instead, we’re pulling into the mandatory haunts like Gehi Campground , where the crystal clear water of the Swampy Plains River comes meandering through. On this clear day, looking back up the valley, a snow-covered range including Mt Townsend stood tall amongst hovering clouds. It kinda felt like Everest Basecamp, at a tenth of the elevation. Up the road we’d detour up to Scammell’s lookout , continuing to marvel at how towering our mountains looked on this very day. Spit balling about lines down the western fall, and hypotheticals of who’s done what out there. Pushing pass the pipes of the Snowy Hydro, a quick stop at the aforementioned Shane-O’s takeaway of Khancoban , before switching drivers and slinking across the border. Greeted by a persistent sunset in Wodonga, the two of us took turns to bash away at our laptop keyboards until we reached Mansfield . I’ve had a long-standing affinity with the Mansfield township and not just because it has an epic bakery. 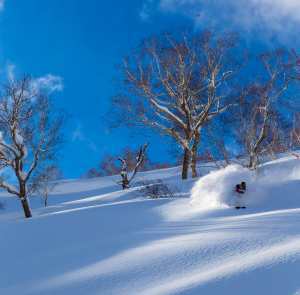 This place has long been a talent pool for Australian Winter Sports, with the likes of Olympic Athlete Alex “Chumpy” Pullin hailing from here. After grabbing some supplies, and a quick bite to eat from the Mansfield Hotel we passed Pullin’s Ski and Snowboard shop, operated by Chumpy’s parents Chris and Sally before hitting Buller’s switchbacks. On the way, we’d skip over the town of Merrijig . Old habits, I guess. We didn’t make the same mistake twice though, stopping in after our short Buller stay. The backside of Mt Buller is dramatic, and it’s on top of the undulating hills of Merrijig , that this is best discovered. This hamlet also offers a great accommodation alternative to staying on the hill. Don’t just stop and revive for the sake of survival, do it because it has the ability to enhance your whole journey. 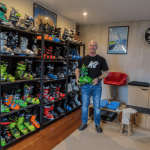 Merrijig is just one of the many gems nestled in the foothills of Australian ski resorts, and to have almost driven straight through it is a testament to the wisdom of Ferris Bueller – “Life moves pretty fast. If you don’t stop and look around once in a while, you could miss it.” It’s all well and good to squeeze as many runs out of your lift pass as possible, but you’ll be doing yourself a favour to stop in at a place like Merrijig. And if Buller’s not your jam, then what about Ropers Lookout on the way over to Falls Creek? There’s a whole bunch of destinations that you should check off on your Aus Resort Roadtrip Bucket list, and they’ve all been conveniently compiled here , as part of #breakpointvic. 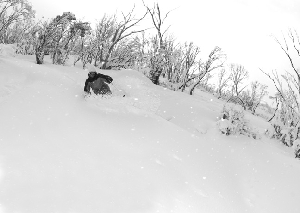 Upon disembarking from Mt Hotham, where deep turns in steep terrain were plentiful (you should go there), we’d decided to take former Mountainwatch Editor Russ Holt up on his 2008 article about jumping the border back into NSW via The Barry Way. Straight through the guts, The Barry Way doesn’t just cut down trip time but shows you some of the most beautiful country on the continent. But know, before you go – ‘cause there’s no turning back (literally). The premise of this short cut is to save you from back-tracking through Wodonga and back over the Alpine way into Jindabyne , which would take 5-6 + hours non-stop. The alternative is to head south east from Hotham, pass the Big D, down through Dinner Plain and out through the back of Omeo past Limestone Creek and onto the Barry Way . This shaves the trip down to 3-4 hours – despite what google says … and is a thoroughfare through some of the most beautiful terrain in Australia. The catch is … it can be sketchy. Going this route means you’re mostly traveling on an unsealed, single lane road that climbs to 1400m – and there’s nothing but national park around you. There are a few things you can do to minimise the probability of getting/becoming/being stuffed . Stuffed: Breaking down, getting bogged, running off the road, getting lost. Fuel: Make sure you’ve got a full tank of fuel when you reach Omeo. Information: Don’t count on your car’s satnav to know where you are. An old fashion map doesn’t hurt and the Omeo information centre sells them. It’d be wise to ring ahead with the VIC parks (13 1963), and get a recent report on the road. Both Telstra and Optus failed to get a signal for the majority of the way so have that map loaded up before hand. Tools: We’d been told to carry a chainsaw with us if there had been high winds in the region recently. A Sound Vehicle: This road is passable in a 2WD, and we found it to be in reasonable condition with some sections moderately corrugated. Our Amarok made mincemeat of it, however carrying chains are a must, and the half-dozen or so signs on the way will tell you the same. Your witts: Given that the road cross-courts some seriously steep country, and is single lane and somewhat impassable in spots, ask yourself before setting off “am I up for it?”, if your answer is no, the Golden Age Hotel in Omeo is a top spot to bed down for the night. On our particular journey, we encountered wild brumbies, deer and the ever-present roo. We didn’t see one single sign of human life until we reached Wombargo, before turning left at the sign that points to Jindabyne. You’re exactly halfway there when you see this sign. Don’t get too used to the sealed road though as it’s short lived and you’ll be back on dirt as soon as you re-enter the Alpine National Park. You’ll also be fighting off the temptation to stop every 100m and take in the view. Spectacular would be an understatement, keep your eyes on the prize though. Zipping through Suggan Buggan and continuing along, you’ll feel as if you’re right there with Jim Craig, living out Banjo Patterson’s poem about The Man From Snowy River. As you breach the bush, you’ll hit the bitumen of The Barry Way which leads you down to the familiar sight of The Station. You’ll be one part relieved, and one part saddened by the realisation that your Barry Way adventure has come to an end. This drive alone will make you reconsider that whole fast-forwarding habit, and your future-endeavours down to the snow will begin to include a little more adventure as time goes on.